Like all goals in life, it all started with a dream, an idea to think beyond the social norm and reach for the stars. Southern California Resource Services for Independent Living (SCRS) Executive Director Rudy Contreras envisioned a program unlike any other. The idea of bringing Science, Technology, Engineering, and Math (STEM) to youth with disabilities became a journey of collaboration and unity. With the partnership from the Columbia Memorial Space Center, SCRS launched the first ever STEM program designed specifically for youth with disabilities in February 2017. SCRS selected youth from six different high schools with various disabilities; all participating in a program to empower them to become future innovators. This five-week program showcased the abilities of 15 youth ranging from 15 to 23 years of age and included curriculum such as: Introduction to Braille, Introduction to EV3 Software, Mechanical Principles, Introduction to drafting, components of 3D printer/plotter, Team Design of conceptual printers, build printer, software walkthrough and function, and printer operation. 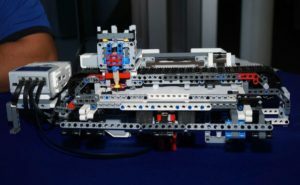 Phase I of the journey came to an end with the successful completion of a Braille Embosser made of Lego Robotics. 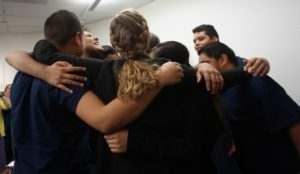 Youth learned more than just STEM; they developed friendships and trust, learning that only in unity can they truly succeed. Phase II will utilize 3D printer technology to bring these embossers to the Blind Community, at no cost and with a more refined appearance. There are times when we as Independent Living Centers are unable to find new resources for those we serve. It is during times like these, that we must be the innovators and creators of these resources. It was an idea of bringing something new and relevant to the disability community that led to this partnership. This project also steered us to the local colleges and universities who were seeking a way to partner with us in some capacity. These meetings created another opportunity: finding a gap and looking at how to once again create a new resource to fill that gap. For higher education institutions, you will often find that Veterans Services are not connected with the College Disabled Student Programs and Services (DSPS). These departments must be introduced and shown how disability intersects with my fellow Vets. We took this opportunity to share how a combat veteran / Executive Director of an Independent Living Center is one person that can share both worlds and benefit from all of the resources. Opening one door can lead to many different paths and opportunities. Rudy Contreras, Executive Director, Southern California Resource Services for Independent Living, is a member of the NCIL Legislative & Advocacy Committee’s Veterans Subcommittee.